It’s easy to design a bracelet that's as unique as you are. Your bracelet is the one piece of jewelry that always symbolises the path you’ve travelled to get here and where you want to go next. 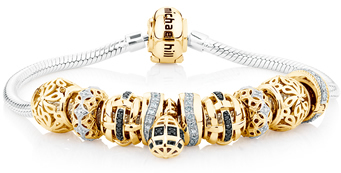 Select which bracelet will provide the perfect base for your new design. You can choose from a wide range of 10ct gold, sterling silver, diamond set and leather combinations to suit your style. Browse our huge range of charms to find the ones that really speak to you. This is your chance to really express yourself. And don't forget, you can always edit your design later. Now it’s time to add some stoppers! Designed to give your special charms extra meaning, and create space so the world can really appreciate your unique design. You should also add a safety chain to keep everything safe and secure when you’re out and about. Once you've chosen your favourite pieces, play with the design a little and make sure you’re happy with it. Move your selections around until everything is placed just right. Voila! You’ve just created your own special piece of jewelry, as unforgettable as the moments you’ve chosen to treasure. Browse our huge range of charms to find the ones that really speak to you.This is your change to really express yourself. And don't forget, you can always edit your design later. Once you've chosen your favourite pieces, play with the design a little and make sure you’re happy with it and it really works as a whole. Move your selections around until everything is placed just right.